There's a reason why cyber attacks use social engineering techniques, it's because the person sitting in front of the screen is usually the weakest link in the security chain. This is confirmed by the findings of a new report from Wombat Security Technologies which shows that in the last year, the number of organizations that reported being a victim of phishing has increased 13 percent, and 60 percent of enterprises say the rate of phishing attacks has increased overall. 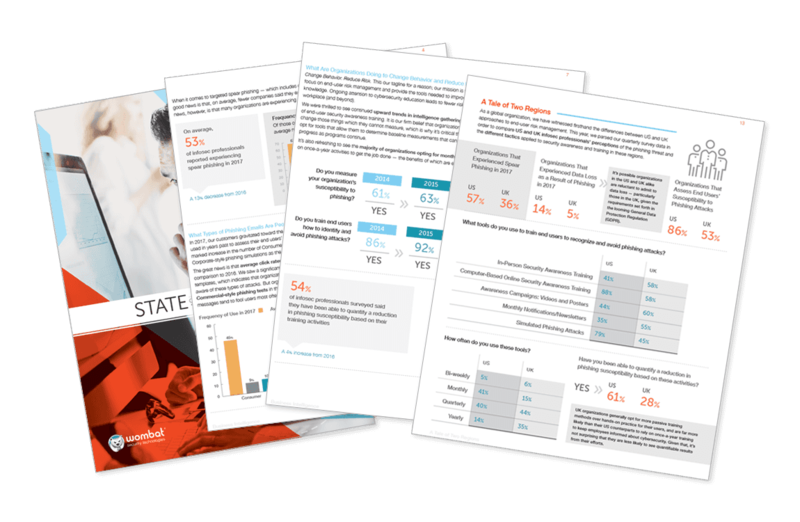 The report used responses to questions to find how well end users are able to identify and manage security threats within the enterprise. It shows that many cyber security threats such as oversharing on social media, unsafe use of Wi-Fi, and company confidential data exposure are dangers in their own right, but could also contribute to the ever growing problem of phishing. "Clearly, phishing is a focus area across the industry, but the efforts can't stop there," says Joe Ferrara, president and CEO of Wombat. "To reduce cyber risk in organizations, security education programs must teach and assess end users across many topic areas, like oversharing on social media and proper data handling. Many of these risky behaviors exacerbate the phishing problem". Main findings are that the number one problem area for end users is safe social media use, yet only 55 percent of security professionals assess employee knowledge on this topic. Protecting and disposing of data securely is the second biggest problem. There are some good news areas though, 90 percent of questions about building safe passwords were answered correctly, as were 85 percent of questions on how to best protect against physical risks, such as ensuring no one follows you into a secure area or not leaving sensitive files on your desk. In addition 79 percent of organizations assess end users on internet safety, and 84 percent of the questions in this category were answered correctly. You can see more detailed findings in the full report which is available to download from the Wombat website.